Tamarack Shack: Finally Cutting Into My Winnings! Last year a friend and i entered the Northcott Quest of the Cure block contest and placed third. Part of our prize was $1,000 worth of Fat Quarters which turned out to be about 330 fat quarters. 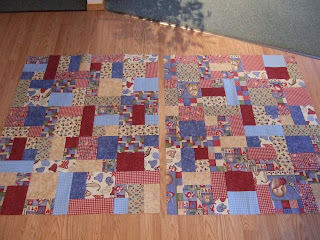 We had fun spliting up the fabric and even put aside some for a quilt we will work on together and then donate to a local charity. Yesterday i finally dug into my box of winning fabric and picked out 12 baby flannel fabrics. Using the Yellow Brick Road pattern i was able to make two baby tops. I still need to find borders and backing but since i don't need any baby gifts right now i can wait until my next trip to Winnipeg. I think i'll be using the Yellow Brick Road pattern a few more times as it used up all the fabric ...no leftovers. I hate leftovers, i usually sacrific them to the fabric gods...with a trip to Paradise (our aptly named local dump). If you've seen my quilting space you'll understand why.